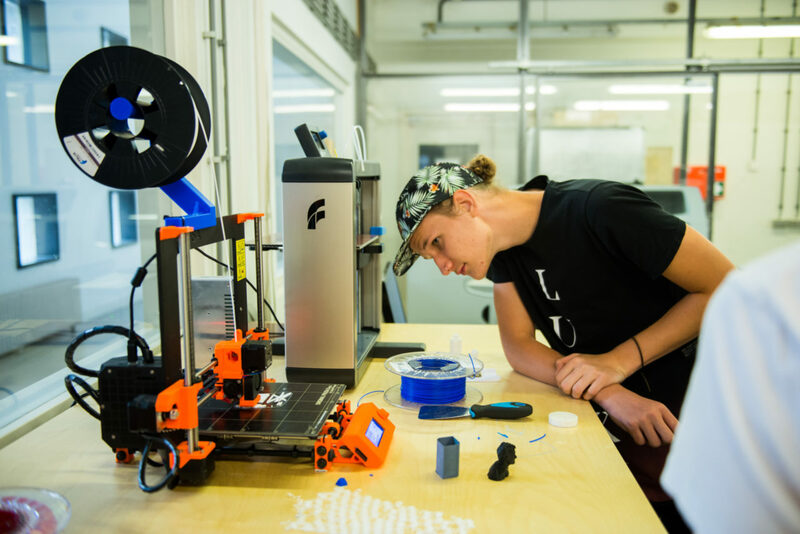 In the KABK’s 3D Lab, students are invited to use different rapid prototyping machines like 3D printers, CNC milling machines and 3D scanners. We try to create a playground where students feel free to experiment with the machines and to challenge themselves to learn the 3D programs. Transform materials such as wood, plastics and metal into a tangible product or component with digital drawings using CNC techniques. Produce a concept model or print a casting mould using a full-colour 3D powder printer – using this technique, digital 3D models are built up layer by layer, in full colour or in white. Or create a digital model from an existing model using a 3D scanner – the 3D scanner scans the model at high resolution and transforms the scan into digital data, which can then be used in many applications in the digital world. Unique to the 3D Lab is the Artec EVA 3D-scanner, a handheld 3D scanner that makes accurate 3D models of medium-sized objects. Workshop instructors are always available for consultations about which material and/or technology is best to use in a project. For those interested, we offer an IST course that teaches students to draw in Rhinoceros and introduces them to all of the possibilities provided by the various 3D printers.